“I have two children aged seven and nine and I love them to bits but am worried that they argue and fight so much. This has been going on for some time and it’s particularly bad during the school holidays – Christmas just past was especially difficult. “My husband had to work right up until Christmas Eve and had to go back to work on Boxing Day, leaving me to cope with the usual post-Christmas let-down and mayhem. 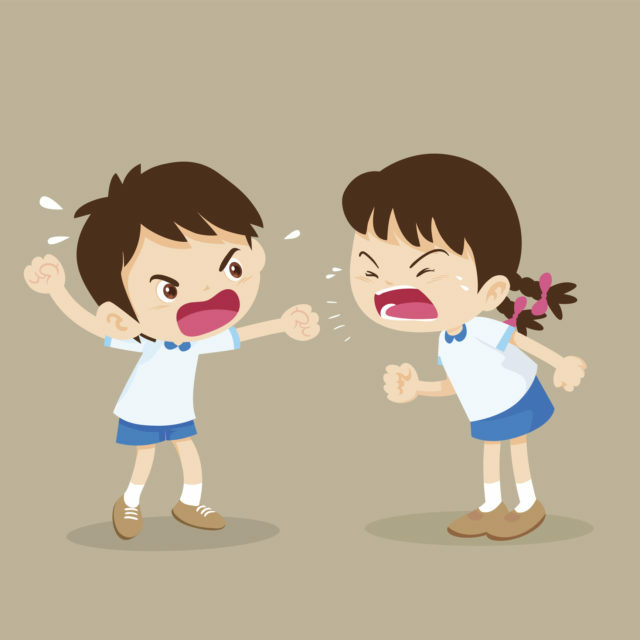 Even during term-time, they find any excuse to argue about everything and nothing, and increasingly when they fight, I worry that one of them will be badly hurt. “My daughter, the eldest, is quick to lose her temper and I think she probably starts most of the confrontations, but her brother is no saint either. Last week, he provoked her by dropping her favourite book in the toilet and this led to a real meltdown. “I spend as much time with them as possible and try to maintain the peace but it’s not easy. We’ve tried punishments for bad behaviour and rewards for good, but nothing seems to work. In addition to a part-time job, I am also studying for a computer qualification so am exhausted most of the time. My husband helps when he can, but he works long hours. “Sibling squabbles are a normal part of family life and most children will at some point fight, argue and tease a brother or sister. It’s a process whereby they learn how to interact with other people and a means for them to assert their growing independence. “Your children are not doing this simply to make your life a misery, nor, I suspect, are they any worse than other children. Understanding this about your children is one thing – coping with it is a whole different ball game. “The good news is, you’re already doing many of the right things. It’s important to step in and stop arguments and fights. “If you allow it or simply ignore it, you’re encouraging it. Similarly, if your setting positive and negative consequences for certain behaviours, it’s important to be consistent. For example, if you threaten to withdraw pocket money when they argue or fight, do it and don’t back down. “I know it’s difficult and exhausting, but over time they will eventually learn. As for the holidays, I wonder if boredom might be partially to blame? I know you give them what time you can, but it seems that this may not be enough especially when part of their day isn’t taken up with school. I say this not to be critical but to suggest that, when you are free to be with them, you make the most of it. “Physically be with them rather than leave them to amuse themselves with TV or other computer devices, then keep them active and involved, and where possible out of the house. Your local library, leisure or sports centre, local authority and indeed their school should have details of activities and clubs for children. The more active they’ve been, the less energy they’ll have to put into arguments.